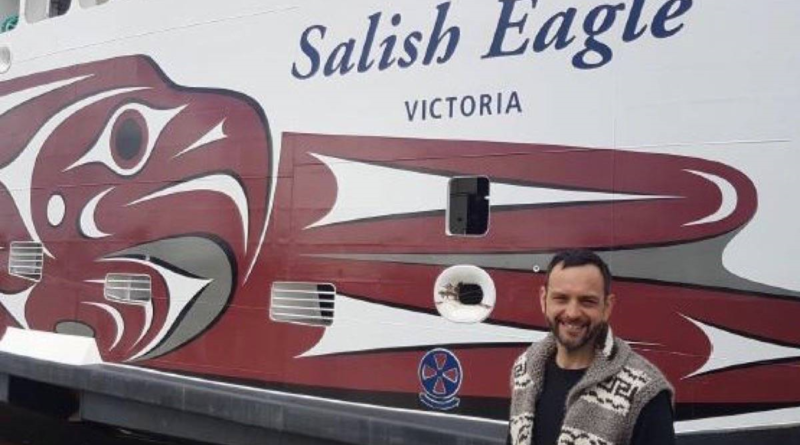 Normally an article about a paint scheme on the hull of a BC ferry would not draw the attention of RUSI(NS) editors (see: “BC Ferries unveils new Coast Salish hull wrap“). Though maybe we are a bit sensitized to the idea of hull art, what with a RUSI(NS) entry in our weekly bulletin some months back about the bow art of HMS Dragon, and recent social media postings about the RCAF Demonstration Hornet (apparently the only Hornet whose type designator is officially CF-18 vice CF188 or CF-188) sporting a Canada 150 paint scheme or livery (either term seems to be in use). Certainly many of us seafarers are used to gun shield art and helicopter FOD cover art, of which there are pictures in official social media postings. No, ship and aircraft art are familiar areas. What particularly grabbed attention was the term “hull wrap.” With visions of the blue plastic covers that adorn recreational boats stored in marinas and boat businesses during Canadian winters, a little searching showed that the technology of a hull wrap is probably well known in the yachting world (e.g., see: “Looking for a perfect Hull Wrap in the UK“). Modern materials readily allow for colours, symbols and text to be applied to vessel hulls. Anyone who has been in the sign shop of base engineering will be very familiar with such use, and car detailing is known to everyone. Okay, so these old salt editors have learned something new, something that wasn’t part of our ‘gray funnel line’ Navy. Not to write that the Navy is not particular about colour schemes. The fog gray of Canadian warships is the result of careful trials (in the 1950s, one recalls), and the dark gray and black of the hard working vessels of the Queens Harbour Masters is practical. Go back a bit further and there are all sorts of ship camouflage schemes – the Naval Museum of Halifax has an interesting display of ship dazzle camouflage, and other patterns are online. Where this all sparks some mulling is back to Dragon. One wonders whether the connect-with-the-Canadian-public efforts of the Royal Canadian Navy would allow for hull wraps to be used on RCN warships. Imagine a warship visiting a namesake city for a major civic event or anniversary whilst sporting some icon of the city proudly display on the ship’s hull side. 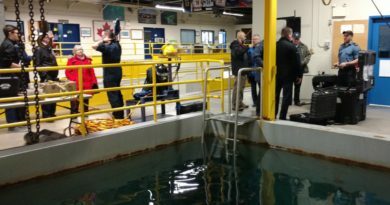 Or imagine the naming and launching ceremony of one of the new Arctic and Offshore Patrol Vessels (AOPV) being held with some Inuit inspired art on the ship’s side as (traditionally champagne, preferably now Arctic water) is broken over the ship’s bow. It would be really cool to see an Oopik on the bow of an AOPV. You wouldn’t need to see the national flag to know the ship is Canadian.